I want to get around the city, to see the view. 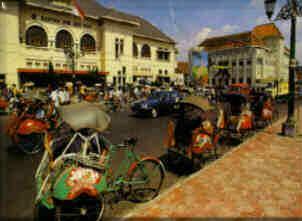 Becak - becak please take me around. That is the lyric of a popular children song in my childhood when becak is ubiquitous. Several years back, becaks have been banned from Jakarta. If it is still exist, I am absolutely afraid to take a becak around the city .... giant buses, high-blood pressured drivers, taxis, motorbike riders will probably curse or even crush you. Riding a becak is no longer romantic. 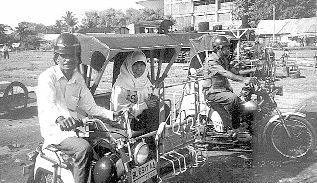 Becak on the upperleft corner is typical of Jakarta and its suburbs. (Photo from Bali Online). What do people in Jakarta ride now? It is something "imported" ..... from India. Curious? Check this out! The second and third pictures on top are becaks in Yogyakarta. It seems that tourists like to ride on one. I do not like Yogya becaks because they are quite small and can be uncomfortable. 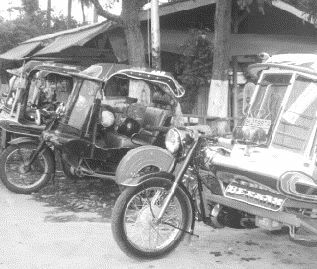 Becak stand (fourth from left-top row) or Indonesians call it pangkalan becak is still common in the smaller cities. 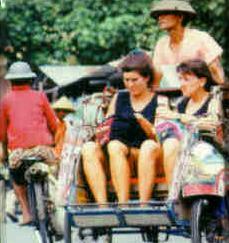 In Jakarta, we won't see such thing because becak is banned. Instead, we will see motorcycle taxis (ojek). 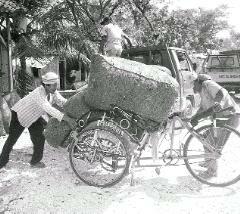 Becak is a multipurpose vehicle. 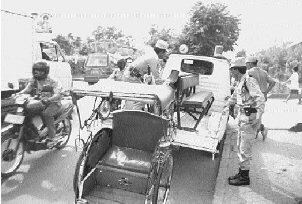 Seen in the picture (lower righthand corner) is a becak used to transport chilli during a harvest. Sometimes people also use it to transport furniture, cattle (small ones of course), and anything as long as the driver can still pull the pedal. (Photo by Sujud Swastoko - Suara Pembaruan the leading Indonesian language evening newspaper).